At best, the United States, its NATO allies and the regime they have collectively created in Kiev, Ukraine, will be able to claim Russia, or militants defending eastern Ukraine from Kiev’s armed incursions, accidentally shot down Malaysia Airlines flight 17 (MH17) after air controllers in Kiev recklessly sent it on a course over a battlefield other airliners had made a point to circumvent. At worst, the US and its junior partners across Europe and the remnants of the British Commonwealth, will be implicated either in shooting it down accidentally themselves, or worse still, shooting it down on purpose in order to frame Russia and anti-regime militants in eastern Ukraine. Russia certainly had nothing to gain by shooting down a civilian aircraft over a battlefield anti-regime militants have been aptly able to hold and defend. But what of NATO and its Ukrainian allies? In a war they are losing, could they have benefited from creating a pretext for NATO to intervene more directly? The gain they have already wrought in terms of propaganda against Russia has been impressive. From the moment the airliner was shot down, the US, NATO and Ukraine have used the incident to indict Russia and more specifically, Russian President Vladimir Putin, in the court of public opinion. It has used legal maneuvering and its well-oiled press to turn the investigation of the disaster into a witchhunt with an inevitable outcome already eagerly determined to implicate Russia. The Western media has intentionally twisted the words of investigators to misrepresent evidence and preliminary and very cautious statements to portray them as definitive conclusions to establish Russia’s guilt. The JIT conducts the criminal investigation and the DSB the investigation into the cause of the crash. Both investigations are conducted separately but JIT and DSB occasionally share material. In its final report the DSB will report on the discovered parts. 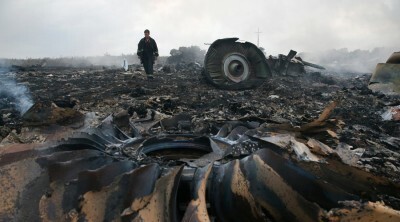 However, from this cautious statement, Western media networks ran with headlines like the BBC’s “MH17: ‘Russian-made missile parts’ at Ukraine crash site,” and the Guardian’s “MH17 crash: Fragments of Russian missile BUK launcher found at crash site,” both of which attempt to implicate Russia even in the title alone. Only after carefully reading both reports in their entirety will a reader discover just how tenuous the evidence actually is. An early draft of the report leaked earlier this year. A US official, who was not authorised to speak publicly and spoke on condition of anonymity, told the Associated Press in July that it showed the plane was brought down by a Buk surface-to-air missile launched from a village under the control of the rebels. This is a bold claim to make, with the DSB and JIT already stating clearly in their most recent August release, that no connection yet has been made between Buk missile parts and the downed airliner, let alone who launched the missiles. If a draft made these claims before this most recent statement, then serious doubt is cast upon how this investigation is being conducted and with the veracity of any conclusion drawn by such an investigation equally as doubtful. Considering the lengths the US and its allies have gone through to deceive the world regarding their crimes against the state of Syria, and considering the gain they have already wrought from exploiting the MH17 disaster, one must question the wisdom and reasoning of the West to go through such extraordinary lengths to at best portray Russia and eastern Ukrainian fighters as guilty of accidentally shooting down an airliner flying over an active battlefield it should never have been directed over in the first place. What is more likely to play out later this month, is that the exhausted credibility of the US and its partners both politically and across the media, will fail to sway public opinion or the facts on the ground in Ukraine in any shape, form or way regardless of the conclusions of the MH17 DSB and JIT investigations. Russia has more than adequately balanced the long-standing monopoly the West has held over the global media space, and will be more than capable of defending itself in that space regardless of the outcome of the investigation. And since the investigation itself has been so transparently manipulated by the Western media and Western politicians, it is likely the vast majority following this investigation will fail to be swayed by any spin placed on the published conclusions. We should remember the chemical weapons attack in Syria, where a UN report’s ambiguous conclusions were transformed into an indictment of guilt by the Western media. Even then, that indictment was brushed aside by the vast majority in the public who had long-since lost their faith in the word of the West. Since then, the lies regarding Syria have reached an unprecedented crescendo with Western credibility at an all time low. This absence of credibility in Syria will likely taint whatever efforts the West makes to spin the MH17 report, and attempts to spin the MH17 report will only expand this void of credibility that has opened up in the heart of the Western World. A wiser circle of special interests might reassess the merit of doubling down on a losing strategy of lying to and manipulating the perception of an increasingly aware public. But a wiser circle of special interests probably would not have found themselves in these circumstances in the first place.